I love cheeseburgers. Who doesn't, right? Well, when I realized that today was none other than (such a day as) National Cheeseburger Day, I figured what better way to celebrate than to enjoy a Smashburger for lunch! It also happens to be the perfect opportunity to share with you an illustration that the Colorado-based burger joint recently commissioned me to do for use at a corporate event the company held last week in one of Colorado's beautiful mountain towns. The illustration itself was brought to me by my dear friend Alexa, who is Smashburger's design guru and official princess of pink (so says I). It was based on the idea of a large forearmed man holding an olympic style torch. 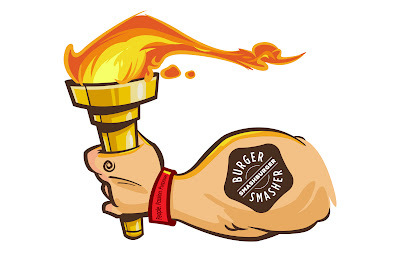 The large forearm represents the "smash" part of Smashburger, as the company's signature cooking method involves smashing the patty with its own burger-smashing iron apparatus (let's get technical here). 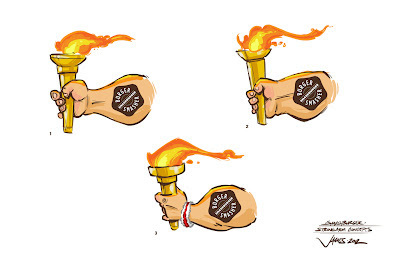 The illustration also incorporates the lesser used brown 'Smashed Burger' logo. 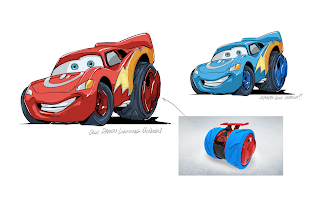 These are the thumbnail illustrations provided for approval. Sketched in Adobe Photoshop. The finished illustration was done in Adobe Illustrator and is basically a cleaned up version of thumbnail #3 with an adjustment to the wristband which states, "People, Passion, Purpose" a slogan used within Smashburger's corporate team.